18 ready-to-use Balanced Scorecards that help to measure and control the performance of hotel. These 18 scorecards includes in total 298 Key Performance Indicators, e.g. 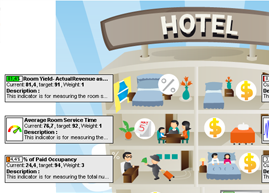 metrics that will help to measure hotel’s performance! Now includes live info-graphic for hotel with 16 more KPIs (license BSC Designer PRO is not included in Hotel KPI toolkit). 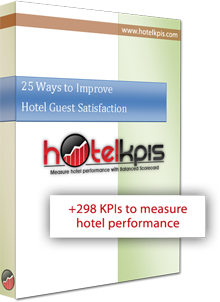 Bonus inside: Guide for training KPI – 15 page e-book delivered as PDF file will explain how to plan and measure training performance of your hotel personnel. Do you run a business in the hotel industry? Would you like to monitor and improve your business’s performance with special metrics? If so, then you need to know about the BSC Toolkit for Hotels. 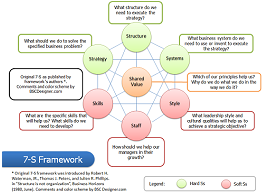 Any business can benefit from using a Balanced Scorecard with well-designed Key Performance Indicators (or, KPIs). But succeeding in the hotel industry calls for different indicators than most other industries. For instance, a good hotelier might focus on guest satisfaction, staff efficiency, and quality leisure services, rather than supply chain management or contractor availability. So, the BSC Toolkit for Hotels starts with 18 complete Balanced Scorecards, including 298 Key Performance Indicators… all designed specifically to quantify the factors that matter most in hotel management. General Hotel Management, including your help desk, HR, and facilities departments. Competitor Analysis, including benchmarking and market research. Hotel Clients, including customer value perceptions, loyalty, and profitability. Leisure Services, including tennis, skiing, golf, and swimming pools. Each scorecard combines 12 to 16 KPIs to give you a clear, accurate picture of your hotel’s performance in one of these specific areas. Using these indicators, your CEO can define strategic goals for the whole company, and then delegate complete scorecards with appropriate KPIs to lower-level managers in each department. That means all of your business units will be able to work together to meet your goals, track your business performance, and help the company grow. These balanced scorecards can even show you where you may need to invest additional resources to keep your company’s progress on track. But that’s only the beginning. The BSC Toolkit for Hotels also includes twenty-five recommendations for improvements that are proven to add value for guests and increase productivity for hotels. Each recommendation includes an analysis of how and why this new feature will improve your productivity, and a step-by-step implementation strategy to help you put it into practice in your hotel. For example, we’ll show you how to create loyalty programs, currency-exchange services, transportation services, and spa facilities, and how to use these features to grow your business. As a free bonus, we’ll even include a copy of our ebook, Guide for Training KPI, which will help you to plan your Balanced Scorecard training program. We’ll help you show your staff how to record KPI data, and we’ll help you show your managers how to evaluate their scorecard results. We’ll even help you to prepare your managers to keep their business units focused and productive. With 18 Balanced Scorecards, 298 Key Performance Indicators, 25 recommendations, and a free ebook, the BSC Toolkit for Hotels includes everything you need to build an effective Balanced Scorecard, measure and improve your business performance, reach your business goals, and succeed in the hotel industry. The clear, realistic, easy-to-understand information included in this resource will ensure that your Balanced Scorecard implementation is a success. 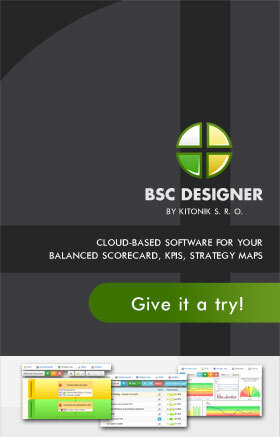 Download the evaluation edition of the BSC Toolkit for Hotels today, absolutely free, at www.HotelKPIs.com.